When the news broke that the Cleveland Indians had completed a trade with the Yankees to acquire ace reliever Andrew Miller, my son texted me four fearsome words: "they are unbeatable now." A touch melodramatic, maybe, but it's not like most of us didn't have the same basic reaction when we heard about the trade. An involuntary flip-flop of the stomach, a grimace, the unwanted invasion of the thought, "there goes the division." It's totally understandable, if you've ever seen Andrew Miller pitch, or looked directly at his statistics while standing at unsafe distances of less than 100 feet away. He strikes out nearly two batters per inning. His ERA is only 1.39. His WHIP is 0.77, which is not even visible to the naked eye. He gave up two runs in the entire month of July. The other bad news, which actually sort of cancels out the first bad news, is that it probably doesn't matter. 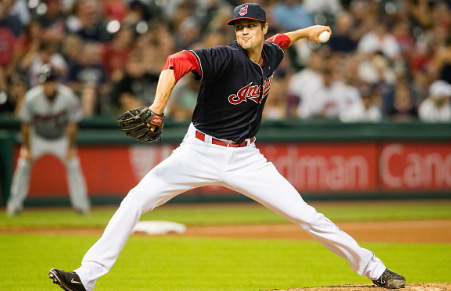 If you're freaking out about Andrew Miller closing games for the Indians, you're falling prey to the Myth of the Closer. The reality is that the ninth inning is, statistically speaking, the absolute worst time to decide to try and win a ballgame you were previously losing. I'd recommend doing that more around the first inning, or the sixth inning at the absolute latest. Across all of MLB so far this year, teams that were leading going into the ninth inning have won 96 percent of their games. Last year, that number was 97 percent, and the year before that, it was 95 percent. In other words, if the Tigers are behind going into the ninth, they're probably going to lose that game no matter who is closing. When the Tigers have been behind headed into the ninth, they've won twice in 44 tries -- that's 5 percent, or to use the language of advanced metrics, a "poop emoji." Does it matter whether or not the team is good or bad? No, not really. Quick, who's got the worst bullpen in baseball right now? No, not the Expos, you weirdo, they're not even a team anymore. It's the Cincinnati Reds, with a team bullpen ERA of 5.24 (their FIP is 5.48 so don't get all stats-snobby with me either). The Reds, with their worst bullpen in baseball, have successfully closed out 97 percent of their games in the ninth inning. Worst bullpen in the American League? That would be the Texas Rangers, who have held on to win in the ninth inning in 93 percent of their games. Even against the Rangers, the Tigers would be facing worse than a one-in-ten chance of pulling off a last-minute comeback. The key to winning games against the Indians, or any team in baseball, isn't to beat their closer in the ninth inning. It's not letting the other team take a lead into the ninth inning to begin with, because the odds are terribly long no matter who's on the mound. Andrew Miller has succeeded in holding a lead or preserving a tie in 91 percent of his chances this year, so yes, he's going to be tough to beat as the Indians' sparkling new Ninth Inning Specialist. But the Tigers have won 98 percent of the games they were leading in the ninth inning, so ... what was that about "unbeatable?"